This past Friday, EL and I spent our first day volunteering at the local Senior Center. I recently mentioned to one of EL's therapists that I had been thinking about finding a place where EL can gain a bit of work experience. So, the therapist took the initiative to set up a volunteer opportunity for EL and I to do together. EL did a great job wiping tables, dusting, and vacuuming at the center. 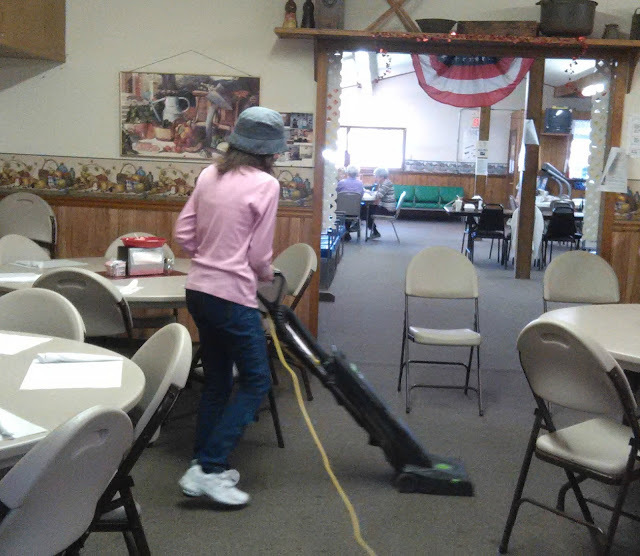 I don't think she was thrilled with wiping tables, but she did become excited when it came time to vacuum. I found out later, she likes to vacuum because she has fun imagining the vacuum being a monster who is eating all the crumbs off the floor. Ha ha ha. I am looking forward to sharing this weekly appointment with EL. I know it will be a great learning experience for her, and we will both be able to serve others at the same time. This is awesome! I look forward to updates! That is wonderful!!! Such a great idea!